. . . Alex Rodriguez had been traded to Boston?
. . . The '94 MLB strike never happened?
. . . Babe Ruth was sold elsewhere?
. . . Williams and Dimaggio didn't go to war?
. . . Michael Jordan had continued playing baseball?
. . . N.C. State hadn't pulled off its miracle?
. . . The Blazers had better injury luck?
. . . Big Ben was drafted by the Giants?
. . . Donald Trump had made the Bills great?
. . . Drew Brees had passed his Dolphins physical?
. . . These field goal attempts had been good?
. . . George Halas had died in a boat wreck?
. . . Jim Harbaugh had stuck with Alex Smith as 49ers quarterback?
. . . The NFL map looked like this?
. . . Peyton Manning went to San Diego?
. . . Teddy Roosevelt hadn't revolutionized football?
. . . Terrell Owens was elected to the NFL Hall of Fame?
. . . LeBron James had chosen soccer over basketball?
. . . U.S. soccer got the right call in the '02 World Cup?
. . . Cleveland had been saved by George Steinbrenner?
. . . These draft moments had happened differently?
. . . Injuries had never altered these five careers?
. . . Lance Armstrong had been whipped by cancer?
. . . Muhammad Ali had never met Malcolm X?
. . . PEDs had been legal all along?
. . . Steve Bartman had never gone to Wrigley?
. . . Things had happened differently for these four illustrious coaches?
. . . Tiger Woods had pursued a career as a Navy Seal?
. . . These trades had actually happened?
. . . Wayne Gretzky hadn't been traded to the Kings? 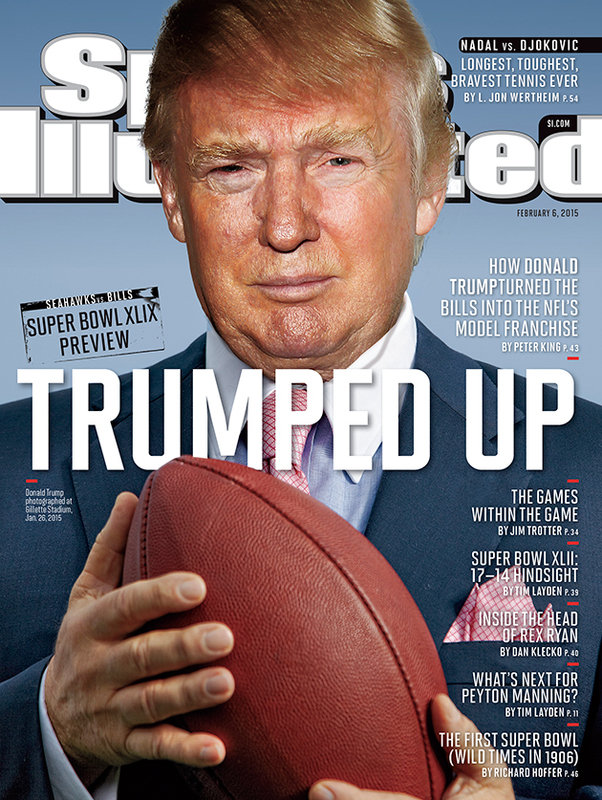 What If ... Donald Trump actually bought the Buffalo Bills in 2014? There was an age—and it feels like generations ago, but really it was early 2014—when Donald J. Trump was thought to be all talk—and with good reason. Perpetually he threatened to bring his showy, bulldozing style somewhere it wasn’t especially welcome. Time and time again, though, something would come up and intervene. But this time it was for real. No more false starts. Advisor Michael Cohen told the papers, “There’s nobody more serious than Donald Trump.” He was, after years of hoopla, going to follow through. He was finally going to ... bid for the Buffalo Bills. Trump had dabbled in football ownership before, trying and failing in the 1980s to spin his stake in the USFL’s New Jersey Generals into an NFL foothold, helping to submarine the smaller league in the process. The Buffalo bid, though, was an entirely straightforward attempt to join the NFL’s ownership ranks. After Bills founder Ralph Wilson died at age 95 in March 2014, his family put the team on the block, and Trump jumped into the bidding alongside the likes of Jon Bon Jovi and natural-gas billionaire Terry Pegula. The people of Buffalo should be happy Terry Pegula got the team but I hope he does better w/the Bills than he has w/the Sabres. Good luck! You can’t say the man isn’t gracious in defeat. But what if he had prevailed? Trump probably would have coaxed Herschel Walker out of retirement, putting him above LeSean McCoy on the depth chart. Maybe he would have offered three years’ worth of draft picks to the Patriots for his dear friend Tom Brady. Bring on the golden uniforms! Golden helmets! Golden turf! Golden Tate! Instead, a great many counterfactuals arose from Trump’s wholly unprecedented presidential election. What if the Republican field had thinned earlier? What if Bernie Sanders had been the Democrats’ nominee? What if Hillary Clinton had chosen a more populist message? But, given the uncertainty and dynamism of a presidential election, none of them can possibly be litigated. 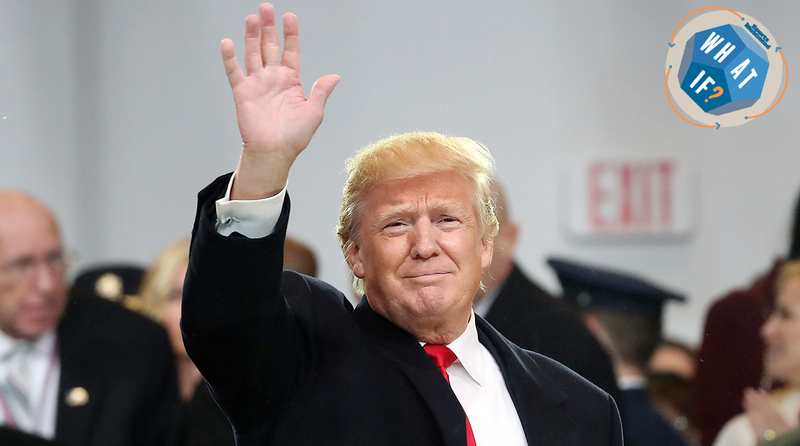 The only one that produces any certainty has to do with football: Had Trump outbid Pegula for the Bills, he would not be the U.S. President today. GALLERY | SportsKid of the Year What If … famous athletes had won SportsKid of the Year?